Image 1 of 15: Azure Cove is a magnificent spacious two-storey villa featuring five bedrooms, each with bathroom en suite, an infinity pool, hot tub, and expansive pooldeck with outdoor dining. A verandah lines the North side of the villa and there is a patio to the South side. 2 of 15: A long dining table, in a spacious area next to the kitchen, seats ten persons. 3 of 15: The Living Room is spacious and comfortably furnished. Two sets of double doors open to the verandah and pool, allowing the trade winds to blow in and cool the villa. 4 of 15: A balcony with easy chairs and dining for two is situated on the upper level to the North of the Master Bedroom. 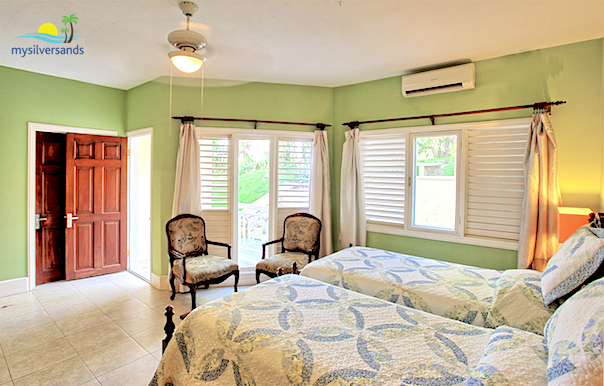 From here, you may enjoy panoramic views of Silver Sands and the North Coast as well the refreshing sea breeze. 5 of 15: The television lounge is located beside the Living Room, separated by huge sliding doors. It opens out to the front porch, the pool and sea view. 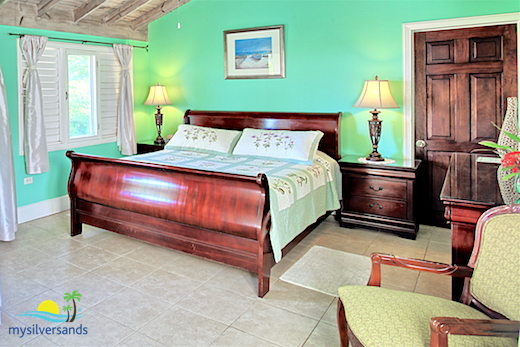 6 of 15: The master bedroom is on the Upper Level of Azure Cove and is furnished with a king size sleigh bed. It opens out to a balcony with a panoramic sea view and cool sea breeze. 7 of 15: Sunny days will find you lounging poolside on the verandah or sunbathing on the expansive deck when you are not enjoying the hot tub or the pool. 8 of 15: Dine outdoors on the verandah beside the pool. 9 of 15: The Living Room at Azure Cove is very spacious and opens out to the verandah and pool deck with a wonderful sea view. The Television Lounge is situated next to the Living Room and also opens out to the verandah. 10 of 15: Lounge in the shade of the poolside umbrella. 11 of 15: There are comfortable seating areas on the Verandah. 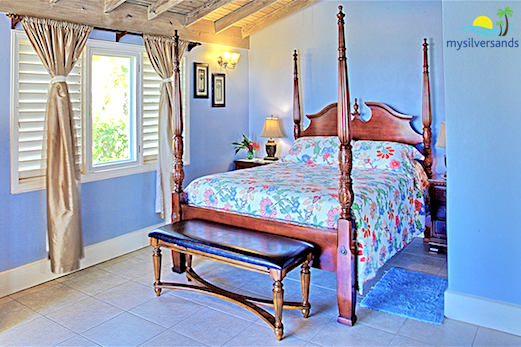 12 of 15: Bedroom Two is furnished with a queen four-poster bed. Like all other bedrooms, it is air-conditioned. It's also cooled by a ceiling fan. This bedroom is on the Upper Level, and there is a private balcony with sea view. 13 of 15: Bedroom Three is furnished with a king sleigh bed. It is air-conditioned and also cooled with a ceiling fan. It is situated on the Upper Level, and there is a beautiful sea view from the balcony. 14 of 15: Bedroom Four is furnished with twin beds. It is air-conditioned and also cooled by a ceiling fan. It is situated on the Upper Level. 15 of 15: Bedroom Five is furnished with twin beds. This bedroom and its bathroom en suite are wheelchair accessible. The shower is also wheelchair accessible. It is situated on the ground floor with a private patio. Like all other bedrooms, it is air-conditioned and cooled with a ceiling fan, and screened louvre windows. Modern Azure Cove is a spacious 5 bedroom two-storey villa with private pool and hot tub, located just a few minutes walk from the magnificent Silver Sands beach. The wheelchair accessible bedroom on the ground floor makes it suitable for those with special needs. Enjoy wonderful panoramic views of the turquoise Caribbean Sea from the expansive pool deck, living room, television lounge and North-facing balcony. Private swimming pool and hot tub with expansive sundeck, incorporating outdoor dining facilities. Spacious verandah lines the North side of the villa. 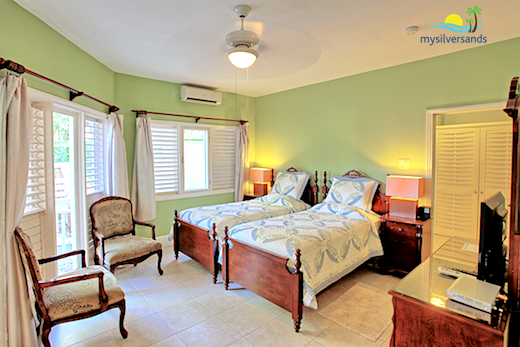 Each bedroom is air-conditioned, has a ceiling fan and features bathroom en suite. Each bathroom is equipped with a hair blow dryer. Three bedrooms with balconies providing great sea views and one bedroom with porch. The ground floor and one bedroom and bathroom en suite are wheelchair accessible. A wheelchair is available. Very spacious Living & Dining Room, which opens to a patio on the South side of the villa. Separate lounge equipped with cable television (reception not guaranteed) and DVD player. AM/FM Clock Radios with iPod or other MP3 Player Docking Station in each bedroom and the Living Room. Telephone. 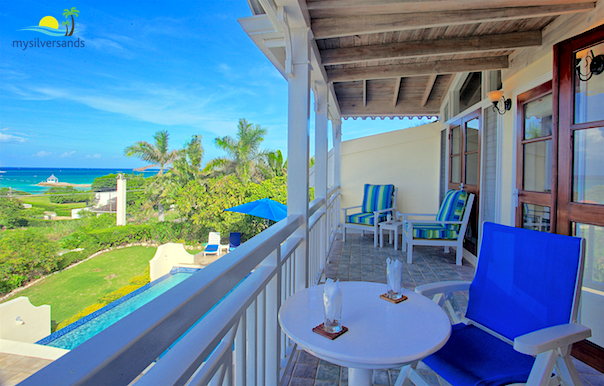 The balconies and porch off the bedrooms are each furnished with two chairs and a small table. Fully equipped roomy kitchen. Barbecue grill. All windows and doors except the main door from the pool area are screened. Four members of staff work flexible hours, and serve early breakfast and late dinner on request. 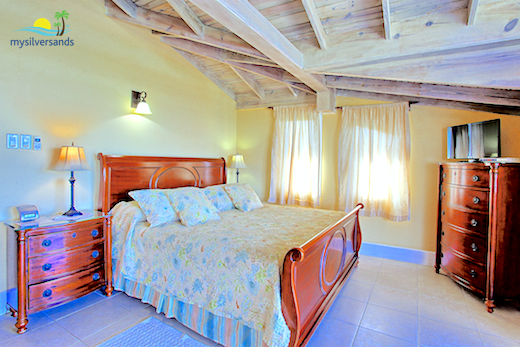 Child-friendly villa with two cribs and two highchairs available. 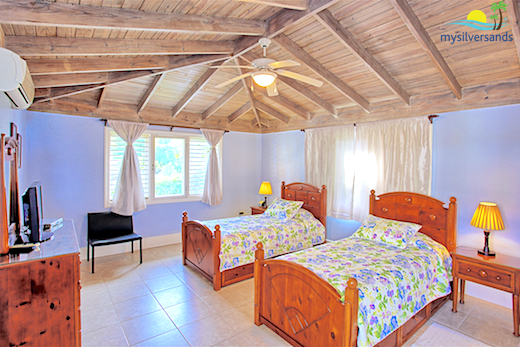 Azure Cove costs from $358.00 to $742.00 per night.